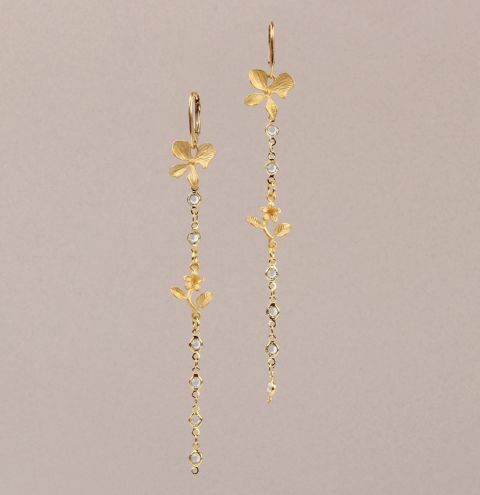 Create a feminine pair of floral earrings for Spring/Summer using pretty matte gold connectors and sparkly crystal chain. Open the loop on the bottom of the ear wire and attach the flower petal charm to it. Cut a 1-inch piece of chain and attach it to the bottom loop of the petal charm. Connect a jump ring to the bottom loop of the chain and attach it to the top of the flower connector. Finally, cut a 1-inch piece of chain and attach this to the bottom loop of the flower connector.